I have always been impressed with the commercial version of PuranDefrag, which I use on my laptop and my wife's laptop. At $19.95 for one, or $29.95 for two, it is great value. Now the news got even better: you can take PuranDefrag home and install it on your home computer(s) at no cost, provided it is for private and/or non-commercial purposes only. Just go to the download page and choose the Free edition. Update: I installed the free edition on my trusty FRAGG testing computer, which I am currently using to access the eFiling web site to fill out my tax returns. There is no difference between the free edition and the commercial edition, other than the license. It has all the features, the same cool layout, and the same ease of use. The guys at Puran Software are being incredibly generous to home users. There are no "nag screens" or irritating sales nonsense. This is a big win for the home user and non-commercial organisations. It seems that CellFind, the guys who illegally took money from my phone account, have been taking a bit more than just money. Now they are accused of stealing intellectual property as well. An entrepreneur who claims to have invented Vodacom's money-spinner, Look4Me, says that former CEO Alan Knott-Craig snr stole his invention - and passed it on to his son, Alan jnr. Internal Vodacom documents in the possession of the Sunday Times show that Knott-Craig snr then went out of his way to spend millions of Vodacom's money on promoting the idea through Knott-Craig jnr's company, Cellfind. Stephen Rodgers, who patented the country's first cellphone tracking service in 2002, claims that, when confronted, Knott-Craig snr was unrepentant. Rodgers said Knott-Craig snr said he had "investigated (the patent) for loopholes and was quite happy to go to court and fight us. He also told my MD that we should go ahead and sue them." The distraught entrepreneur and investors in his company, Gridwatch, had already ploughed R12-million into the business, which soon collapsed. Gridwatch's tracking system - known as Multi-Alert - was used by Vodacom in 2003, signing up over 3000 subscribers within months. The article goes on to give more detail of how Gridwatch was asked to hand over plans, patents and specifications to Vodacom's lawyers. It seems their good faith was exploited and soon thereafter the new service replaced the old one. Vodacom then allegedly went to "major expense" in marketing Look4Me for Cellfind, including providing Knott-Craig jnr with access to Vodacom's subscriber base. It's high time that Internet Solutions put the "S" back into ISP. I can understand Telkom being completely useless, since they are a bumbling state monopoly, but Internet Solutions is part of a commercial organisation listed on the London and Johannesburg Stock Exchanges. So what's their excuse, apart from greed? Take a look at the traffic graph above. I have a 384kbps ADSL line. In SA that's regarded as "broadband". It's Monday and I'm running 3 simultaneous downloads, two from Audible.com and a podcast from twit.tv. It's 4am in the morning in the USA, so these web sites are hardly likely to be overloaded. Yesterday I downloaded a similar audiobook from Audible, and the download went as fast as my line would allow, i.e the yellow line maxed out just above the green graph line. Today, if I stop the podcast download, the graph pattern gets even slower, and the line runs at about 50% capacity. I have queried worse performance than this once before, and ISDSL have been unable to explain why this is happening. They also can't or won't provide me with a proxy server that I can use. 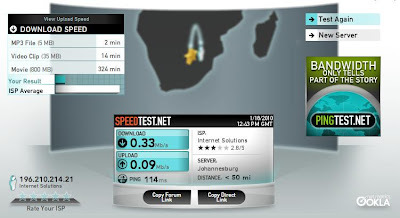 When I used the Telkom/SAIX ADSL offering, I could connect to dsl-cache.saix.net:8080 and podcast downloads would often go much faster, because the podcast was already cached locally. ISDSL have a bunch of "invisible" proxies, but they can't tell me which one I am connected to. This has caused other problems, for which they have been unable to provide a "solution". Everyone said that when the Seacom cable was connected in SA that we would have more bandwidth and lower bandwidth costs. Clearly this is not happening, or the Seacom cable is already oversubscribed. My guess is that Internet Solutions wants to pay for as little international pipe as possible, and just screw their customers like Telkom does. In the past they blamed Telkom. Who are they blaming now? Their shareholders? Update: I called the Telkom ADSL fault logging service, and they "recreated the port" and then during the next few minutes we logged 5 ping timeouts between the modem and its own gateway, 196.210.152.129. 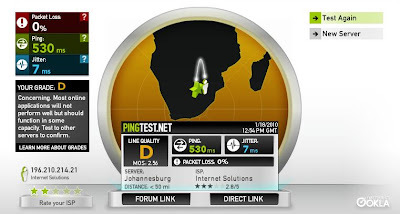 I stopped the pinging and ran the speedtest.net and pingtest.net tests, results shown here. 384kbps works out at 0.375Mb/s, and I'm measuring 0.32Mb/s locally. The technician reckons if I upgrade to a 512kbps the problem will get worse. 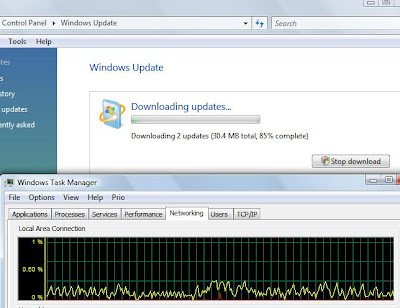 Update 26 Jan: Windows update at 10pm on a Tuesday evening is back to its usual nonsense. Of course it's Microsoft's fault, and not the local caching server. That's why there is no "S" in ISP. I did notice that when I used Firefox to go to a gdgt.com page with plenty of pictures on it, then the download speed maxed out while the pictures were loading. So are they just sluggish with single or double download threads, but fine with, say, 4 or 8 download threads? The mind boggles. 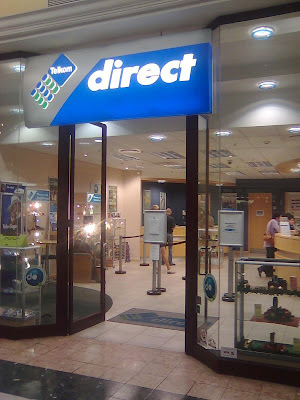 This is the Telkom Direct shop at our local Cresta shopping centre. If you walk inside the first notice you will see is the one that says "We are offline". How ironic. Telkom is the telecomms company that has exploited and ripped off the South African public for years, first as a monopoly, and now as the smug major player in the (declining) landline telephone market and the growing "broadband" internet market. They tout the "success" of their Telkom Business product, and proudly proclaim how much fibre they are putting in to cope with the 2010 Soccer World Cup tournament. Now all they have to do is get the stuff to work. Reliably. All the time. I guess that includes their own outlets, like the one in Cresta. Of course there is no backup plan, or connection using a 3G mobile data card from one of the mobile carriers, or even their own WiMax service. That would require initiative and planning, something they don't seem to have. They didn't have any forms I could fill in, and of course they just said "Come back on Monday" rather than offer to call me once they were back online. Telkom was never known for their customer service, or their data speed. The post office is faster. Update 11 Jan: I called 10219 and ordered the line extension. Got a reference number 29340/43 and a scheduled date of 15th Jan. I said they must call before coming. Update 15 Jan: They didn't arrive, and left a message to say they would be coming tomorrow. No contact number or name. Duh. Update 16 Jan: Arrived without calling. I wasn't at home. Will have to reschedule. Update 18 Jan: I called 10219 and they said that the job would be done on Thursday 21 January. Update 21 Jan: Installation completed. This commercial shows how the DriveCam device can be used to identify the cause of vehicle damage and driver fault in the event of a collision. The camera records the view ahead (what the driver sees) as well as behind and in the cab (what the driver is doing). If the vehicle swerves, experiences a bump or shock, or brakes suddenly, the camera saves a 20-second clip, both before and after the incident. I have watched several of these videos, and some of them show a shocking lack of driving sense by some drivers. Needless to say those drivers have been fired or reprimanded by their employer. In other cases the driver behaved correctly, and the other vehicle was clearly at fault. This has helped companies claim from insurance and has helped drivers maintain their good reputation. Full disclosure: I have done programming work for the company that supplies these cameras in South Africa. My first private email address was vmusic@global.co.za, which I signed up for as a 28.8kbps dial-up account around 1997. I foolishly published this address on my www.worship.co.za web site, and in forums before spam was an issue. At some point, I think around 2000, the old Global Internet Access company was bought out by World Online, which was so slow we called it "World Offline", and they in turn sold to Tiscali, at which point I got a vmusic@tiscali.co.za alias, and cancelled vmusic@global.co.za. I also signed up with spamcop.net, because I was tired of getting spam and I decided that I would not give out my tiscali.co.za email address. Unfortunately it isn't easy to get call centre operators to spell "spamcop.net" so from time to time I relented and gave out my vmusic@tiscali.co.za address. I also made the mistake of giving this address to a hosting company who promptly put it on a domain registration record. Bad idea. But the cat was now out of the bag. I'm not sure which source it was, but eventually a smug slimeball called Mark Tribelhorn and another devious character called "Mike" or "Brent" decided to put my vmusic@tiscali.co.za address on their mailing list, which they sold repeatedly to equally naive or dumb people who wanted to sell me stuff. So I have now cancelled the email alias completely. Which is why I am happy to publish it on my blog, where the spambots can find it and waste their time. If you want to contact me, use the information in the graphic below. Don't even think of putting this address on a marketing list, because I react very badly to spam. It's illegal, and I will publish your email address on my web site, where I know the spambots will find it and send you adverts for watches and medication and stuff. Spamcop.net filters out around 200 spam messages per day, and the few that get through get dealt with by my ESET antivirus package. It keeps my blood pressure down and my focus on work.